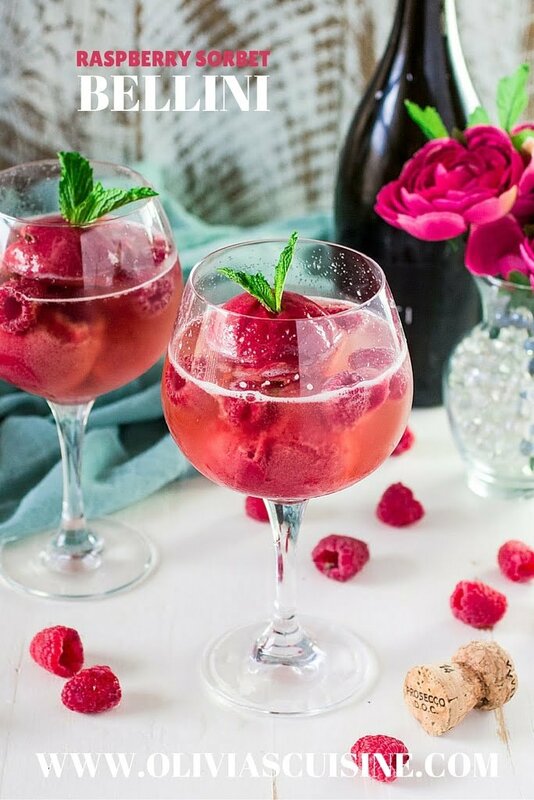 … you celebrate by making refreshing and delicious Raspberry Sorbet Bellini! Even though we had a pretty mild winter here in New York – with the exception of one really bad snowstorm and some cold days here and there – I’m always excited when the flowers start to bloom and I start noticing things like the smell of fresh air and the warmth from the sun. It is that time of the year, where my Brazilian self comes out of hibernation, and decides to join the world in all the fun outdoorsy activities, like picnics, walks in the park/beach, outdoor movie screenings and, of course, Sunday brunches! Oh yeah, I’m pressing pause on my Netflix marathoning so I can tend to more urgent matters. Like all those mimosas and bellinis. Because they are not gonna drink themselves, are they? ? All there is to this cocktail is: Add scoops of sorbet to a glass and pour the prosecco over it! The sorbet begins to slowly melt and science gives you this refreshing and frothy Bellini. Thanks, science! And sorry I didn’t pay too much attention to you during my school years! ? Now, since this recipe (Recipe?? The audacity!) is so simple, it completely relies on good ingredients. You simply cannot make a good Bellini with bad sparkling wine. So, for this cocktail, I went with a delicious bottle of VOVETI prosecco that is not only upscale, but also affordable. After having partnered with the Ferrer family in past posts, I was happy to learn that VOVETI was a collaborative effort between them and the Collavini family. The two visionary winemaking families, each with over a century of experience making exemplary wines, teamed together to produce this unique new artisan prosecco that is both a pleasure to drink and expressive of Italy’s finest prosecco fruit. They only produce 15,000 cases per year, so you can bet this is a high quality product! 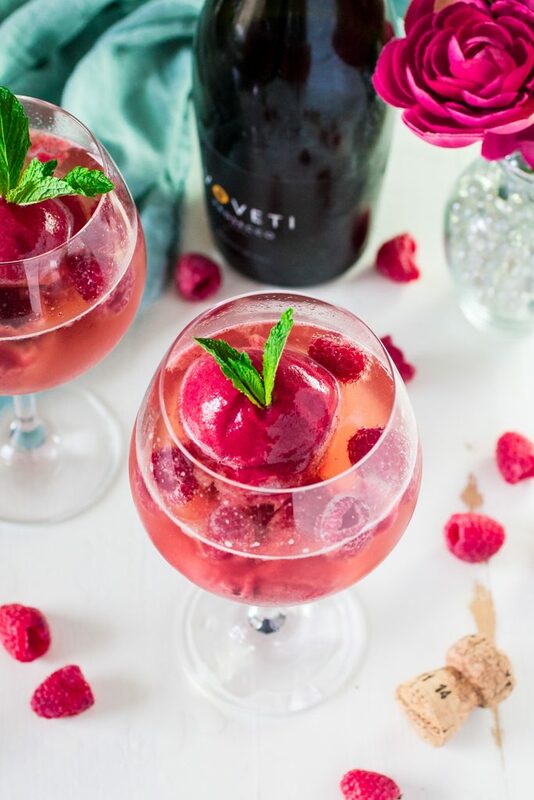 With its golden apple, pear and melon flavors framed by enticing acidity, VOVETI Prosecco is the elegant, versatile choice for entertaining. Fragrant, foamy and lightly sparkling, VOVETI is the ideal “anytime” wine. 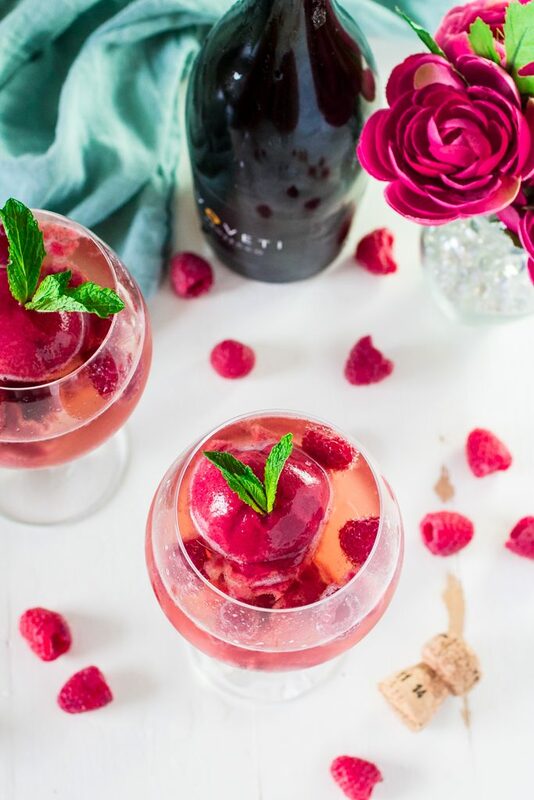 Simply pop open a chilled bottle of VOVETI or use it to make a refreshing cocktail, like this Raspberry Sorbet Bellini! You can make a sorbet Bellini with any sorbet flavors you’d like. I chose raspberry because not only it’s my favorite, but it would also look fabulous in the pictures! I know some purists will say a Bellini is only a Bellini when made with peach (and in champagne flutes), but I couldn’t care less. If you’re too busy arguing over titles, it means your cocktail is not delicious enough. And that is definitely not the case here! Now, if you’ll excuse me, I have a glass of this Bellini waiting for me! At 11am? Oh yeah! It is Sunday, after all! ? Place 2-3 scoops of sorbet in each glass. 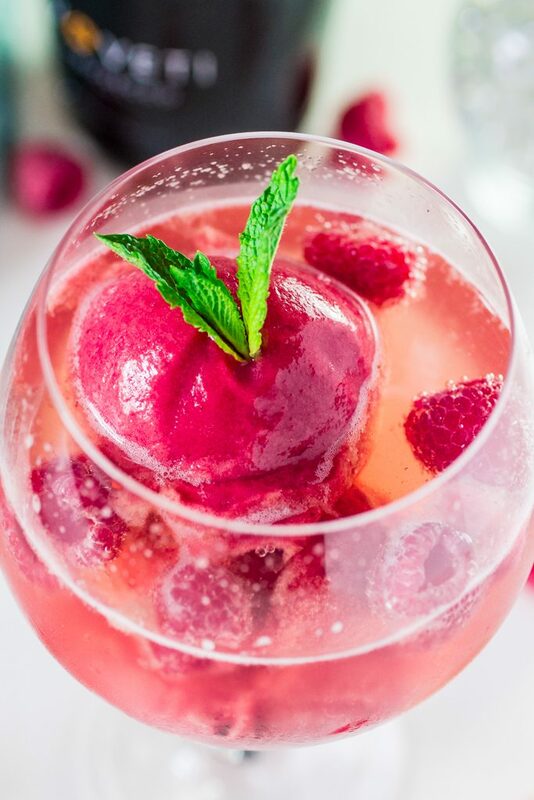 Pour the chilled prosecco over the sorbet. For a kids version, substitute the prosecco for some lemon lime soda! So simple yet such a wonderful idea! Can’t wait to try these! !